If you love seafood and spicy stews, I’m sure you’ll absolutely love this one, called maeuntang in Korean and spicy fish stew (or soup) in English. It can be made with pretty much any type of fish but most importantly the fish should be fresh! In this recipe and video I use black sea bass, or nongeo in Korean, so this dish would specifically be called nongeo-maeuntang. On a recent trip to Montauk, Long Island I was lucky to get fresh-caught black sea bass right off the dock, as soon as the fisherman brought it in. I know a lot of you won’t be able to find fish that fresh, so in your local fish market choose a fish with clear eyes and a firm body. Make sure it isn’t smelly at all and has red gills on the inside. You may have to open the fish head a bit to check the color of the gills. If they’re brownish, don’t pick that fish. White fleshed fish is best for making maeuntang, so flounder, fluke, yellow corvina, and red snapper will all work well, but any kind of fish will be good, as long as it’s fresh. Maeuntang is one of Koreans’ most-loved seafood dishes. Most Korean households have all these seasonings on hand, so it’s a great way to share a delicious, fresh fish with friends and family. It’s easy to make and the savory, spicy stew sits in the middle of the table and everyone can enjoy it together. Combine the seasoning paste ingredients in a bowl. Mix it well with a spoon. Set aside. Combine the radish, dried anchovies, and 8 cups of water in a large pot. Cover and cook for 20 minutes over medium high heat until the radish turns a little soft. Add the fish and about half of the seasoning paste. Cover and cook for another 20 minutes over medium high heat until the fish is fully cooked. Remove the anchovy pouch and add green chili pepper and green onion. Taste the soup and add more paste if you want it spicier and saltier. Gently stir the stew a few times with a wooden spoon and cook for about 3 to 5 minutes. Turn off the heat and add the chrysanthemum greens and red chili peppers. Serve with rice, kimchi, and a few other side dishes, if you have them. You can put the stew in the middle of the table, with a ladle. Provide bowls for each person and ladle some of the stew into each bowl. Provide an empty bowl for bones. As people eat the fish they can discard the bones there. Posted on Tuesday, September 30th, 2008 at 9:11 am. Last updated on November 3, 2018. Posted September 15th, 2010 at 5:44 pm | Log in to reply. Can I use it instead of kelp. Posted September 16th, 2010 at 2:33 pm | Log in to reply. Thank you for your question. 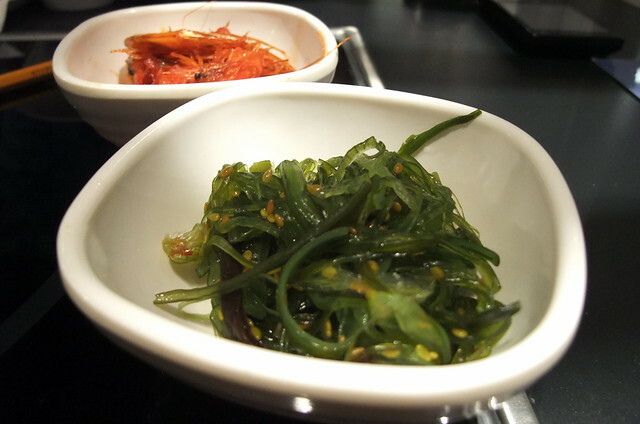 The seaweed is different from kelp. Besides you will have to use dried kelp to make delicious stock. To make maeuntang (spicy fish soup), skip dried kelp if it’s not available. As long as your fish is fresh, the soup will be very tasty. Posted September 17th, 2010 at 12:52 am | Log in to reply. Thank you Miss Maangchi for your clearly reply. And sure I will make miyukjulgi bokkeum and all your Korean recipes if I find the required ingredients. Posted August 19th, 2010 at 7:09 pm | Log in to reply. Hi, y’all. Does any one know of or have a recipe for Sungeoguk? Apparently it’s a (nonspicy) trout soup from North Korea (Pyongyang). There was a similar soup made on the K-Drama “Gourmet”. It looked totally DELISH; my mouth just watered. If not, I wouldn’t mind creating my own recipe. Any ideas or suggestions to get me started? Many thanks! Posted August 20th, 2010 at 8:11 pm | Log in to reply. Please leave your question here on the forum. Someone else may know the answer. I hope so! Posted March 7th, 2010 at 11:00 am | Log in to reply. Posted March 7th, 2010 at 1:02 pm | Log in to reply. yay! congratulation on your success! You are living in Missisauga! I have a few friends living there! Nice meeting you through my website! Posted March 8th, 2010 at 8:32 pm | Log in to reply. Posted February 15th, 2010 at 3:08 am | Log in to reply. Posted March 7th, 2010 at 1:03 pm | Log in to reply. Posted January 7th, 2012 at 3:52 pm | Log in to reply. Posted October 15th, 2009 at 9:21 pm | Log in to reply. Posted October 16th, 2009 at 6:08 pm | Log in to reply. Posted February 28th, 2010 at 11:22 pm | Log in to reply. Hi Maangchi, I live 4 blocks from a Korean Market and I made this today because it is my favorite Korean Dish. Your recipe is better than the restaurants. I can’t believe it turned out so good. Love the video. Hope I can meet Mila also, best wishes!! Posted March 1st, 2010 at 9:03 am | Log in to reply. very nice! I like to taste your maeuntang! : ) oh, I should contact Mila and let her know she has a fan! Posted September 30th, 2009 at 10:42 pm | Log in to reply. There is a soup I always get with my auntie in south Los Angeles that looks like the soft tofu soup, but has some kind of white fish cut crosswise with mussels and clams, is this the same as maeuntang or what seafood soup would it be? Posted October 1st, 2009 at 8:22 am | Log in to reply. yes, it’s maewoontang made with the white fish (cod or pollack?) and clams. Posted August 8th, 2009 at 4:33 am | Log in to reply. Hi Maangchi, I was wondering if redsnapper is the traditional fish used in this stew. Is there an alternative to cod and snapper? My wife made this out of rainbow trout and it wasn’t very well received. Posted August 8th, 2009 at 8:20 am | Log in to reply. You could replace red snapper with other kinds of fish except for cod. : ) Cod flesh is so soft that it’s easily broken when you boil it. The recipe for cod maewoontang is different from red snapper maewoontang. You could use a croaker, flounder,or flatfish instead of red snapper for this recipe. Good luck with making delicious maewoontang! Posted August 10th, 2009 at 12:20 am | Log in to reply. Thanks very much! I will try to make it as surprise for my wife. Posted August 7th, 2009 at 12:03 am | Log in to reply. Posted July 27th, 2009 at 12:35 am | Log in to reply. and i was wondering if i could use it here. Posted July 27th, 2009 at 6:54 am | Log in to reply. Baekseju (백세주)! Sure, you could use it. Posted July 20th, 2009 at 5:58 pm | Log in to reply. I was wondering, when you soaked the clams overnight did you leave it out or put it in the fridge? Also Do you have a substitute for kelp? Posted July 21st, 2009 at 8:19 am | Log in to reply. Posted July 15th, 2009 at 10:36 pm | Log in to reply. I was wondering if the fish could be substituted for a crab (i like your recipe for the broth..!) and would it be close to an authentic ggot gae tang (crab soup)? Or..would that not taste right? Any suggestions would be great too! Posted July 16th, 2009 at 5:54 am | Log in to reply. You can use crabs, but authentic ggotgaetang (crab stew) recipe is a little different from fish maewoontang. I will post the recipe later. Thanks! Posted June 5th, 2009 at 12:23 pm | Log in to reply. Posted June 5th, 2009 at 9:35 pm | Log in to reply. And for maeun tang (spicy fish stew), plain tofu (for stew) is used. Posted March 9th, 2009 at 6:32 pm | Log in to reply. Posted March 9th, 2009 at 10:40 am | Log in to reply. o thanks for the reply.. i replaced the pepper flakes to paste and it turns out nice. i got another question for you, i am now in singapore and cant find the vegetable in your recipe here in singapore. if it can be found than where can i find it, if not than do you have any other types of vegetable to substitute that i can find in singapore? Posted March 7th, 2009 at 9:44 am | Log in to reply. This recipe was originally posted on September 30, 2008 at 9:11 am by Maangchi. It was last updated on November 3, 2018. The video was watched 327,570 times on YouTube & has 11,056 likes! This video is a remade version of an earlier recipe. The original video was posted on 2008-09-30 and has 568,791 views.